If you’re anywhere skeptical about drinking something flavored with birch, keep in mind we’ve been using roots, bark, leaves for ages to make medicine and drinks (root beer, ginger ale). IZZE’s website also mentions, “Once worshiped as a Goddess in Russia, the birch tree offers a rare extract that gives you the divine taste of IZZE sparkling Birch.” I was hesitant that I’d have an epiphany while drinking the stuff but I gave it a go. Interestingly enough, birch drink/soda/beverage (or “birch beer” as it’s usually called) is a pretty common thing on the other side of the country (take note there’s actually an alcoholic birch beer, because frankly, you can pretty much make alcohol out of anything). Perhaps evergreen flavored soda and liquor are in order for the Great Northwest, though I’d recommend trying balzams if you’ve ever wanted to experience what a distilled forest would taste like. At first sip, this drink was very similar to root beer (which I have to honestly admit I’m not the biggest fan of). Compared to its darker brown counterpart, the taste was just slightly fruitier and didn’t have the strong carbonation bite that most commercially produced sodas too. It also uses sugar so there’s none of that syrupy, cloying HFCS taste. The drink is colored with “natural apple extract” which I assumed gave it its apple juice-like hue. The other reviews I read were pretty harsh but I guess if I paid the Whole Foods price for a bottle of this stuff, I might be a bit upset too. 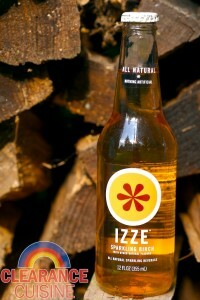 Though IZZE was bought by PepsiCo in 2006, I look forward to trying their other drinks they have on the market. While I wasn’t the biggest fan of this particular drink, I admit I did have by anti-root beer bias going into it. I think you would enjoy if you’re a fan of the herbal-style flavor (you could even attempt a birch float if you’re so inclined). I do admit I really enjoy the other IZZE flavors I’ve tried in the past (blackberry, clementine and grapefruit flavors) so unfortunately, my dislike of this one was purely a choice of personal preference. This entry was posted on Wednesday, August 3rd, 2011 at 8:00 am	and is filed under Drinks. You can follow any comments to this entry through the RSS 2.0 feed. Both comments and pings are currently closed.